Due to wide experience in Marine Sector we also having products which is very commonly used by marine indutry like on Ships, Ship Building, Offshore Rigs, Platforms, Offshore Jackets. Safety Helmets, Leather Gloves, Cotton Gloves, Antistatic Safety Shoes, Sea Boots, Raincoats, Safety Goggles, Ear Plug, Ear Muff ,Welding Helmets, Welding Electrodes, Cotton Rags, Paint Rollers available in all sizes, Radiant Brush / Dog Leg Brush, Wet Mops, Plastic Brooms, Hand Brooms, Mop Bucket Wire Brush, Scrapper, Wire Brush. There are various other products such as cotton rags available in different quality all having different absorption capacity used by various Industries / Sectors like for Railways, Engineering, Pharmacheticulas, Fiber Glass Industries. 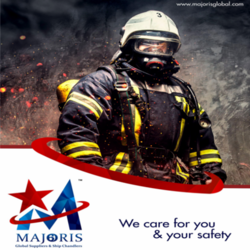 Also we have products for Construction Sectors like Helmets for labours, Supervisors, Work Vest, Labour Shoes, Hard Brooms, Shovels. We are completely commited to provide best possible services and good quality products to our customers. We strive to put in our best possible effort to satisy our customer as per their requirement.